She performs regularly accompanied by orchestra, in piano solo, chamber music and lied recitals, in important music halls in Europe and beyond (Spain, France, Belgium, Italy, Germany, Brazil, Indonesia…). She has played as soloist accompanied by the National Orchestra of Belgium, the Seville Royal Symphony Orchestra, the Bari Symphony Orchestra, the Royal Chamber Orchestra of Wallonia, the Spanish Youth National Orchestra, among others, in concert halls such as the “Auditorio Nacional de Música” (Madrid), Zaragoza Auditorium, Auditorium “Ciudad de León”, Lille Opera House, Sibelius Academy Concert Hall (Helsinki), Palais des Beaux Arts (BOZAR) and Flagey Auditorium (Brussels) or Teatro Santa Isabel (Recife). She has offered recitals sponsored by important foundations, such as the Carlos de Amberes Foundation in Madrid, Patrimonio Nacional of Spain and Instituto Cervantes. She has won prizes in important piano competitions, such as the Special Prize “Rosa Sabater” to the best interpreter of Spanish Music in the 55th International Piano Competition “Premio Jaén”, Medal and Special Prize “Instituto Cervantes” in the 54th International Music Competition Maria Canals of Barcelona. First Prize in the “Manuel del Águila” Piano Competition, Second Prize in the “José Roca” competition or Second Prize and Prize to best Spanish music performance in the “Ciudad de la Línea” competition. Her Spanish music performances have been highly awarded both by critic and public. 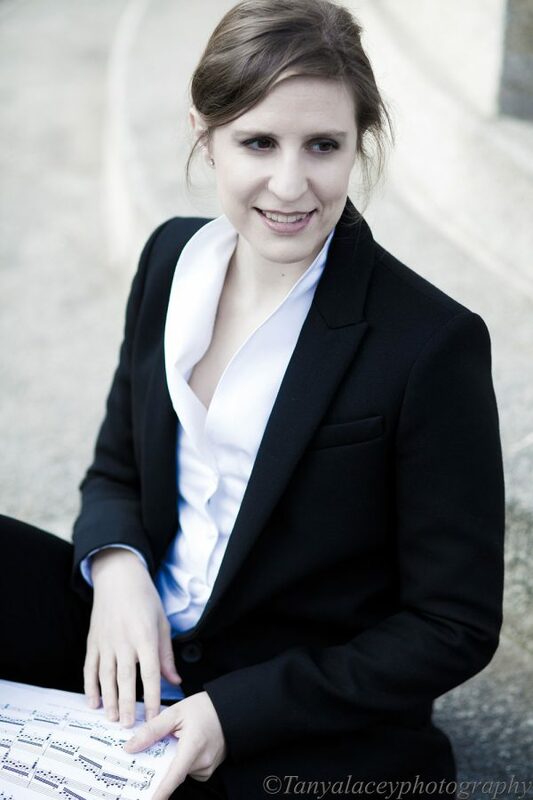 From 1999 to 2003 she has been the pianist of the National Youth Orchestra of Spain (JONDE), taking part in important tours in Spain and other European countries. In 2002 she made her debut in the National Auditorium of Madrid and in the Auditorium of Zaragoza, performing as soloist, accompanied by JONDE, pieces by Rafael Rodríguez Albert, which she recorded on CD. Her love for chamber music has led to projects with different groups and soloists. Since 2015 she plays in duo with the Spanish pianist Laura Scarbó, forming the Scarbó Duo, taking part in important festivals and events. Her passion for symphonic music inspired her to study orchestra conducting with maestro Borja Quintas, making her debut as a conductor in 2015. In this brief period, she has already conducted professional ensembles and orchestras such as the Symphony Orchestra of the Catholic University of Murcia (OSUCAM) and the JMJ Symphony Orchestra and Choir. She has taken masterclasses with renowned conductors such as Bruno Aprea or Vladimir Ponkin. She graduated in 2018 with the highest distinctions. Cristina is also very interested in the educational field. In 2008, after passing an open competition, she became a teacher at the conservatories of Madrid. Among her latest engagements as a pianist, she has offered recitals at the prestigious Maestranza Theatre (Seville), the Juan March Foundation (Madrid), the Gran Teatro Falla (Cádiz) or the National Philharmonic of Ukraine (Kiev). Her latest CD recording, “Perpetuum Castillo” (IBS Classical), is dedicated to the Sevillian composer Manuel Castillo.